the main loop and main window class StelMainView. This single-instance class is created at startup by the main() function. 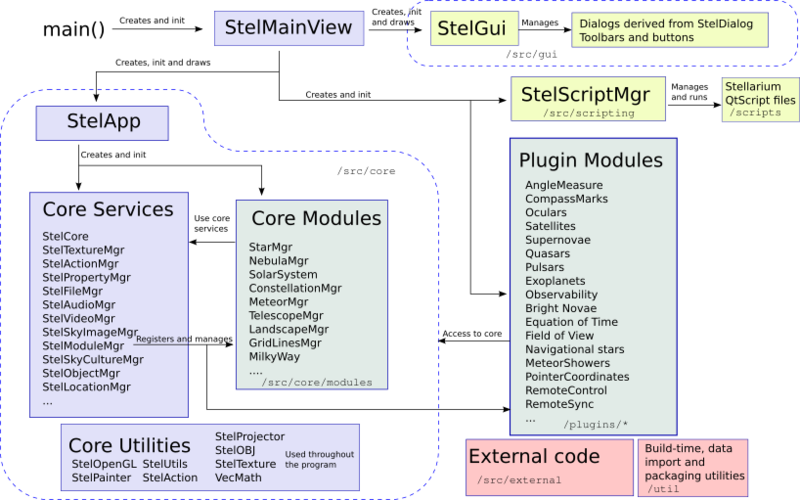 It hosts the main OpenGL viewport (based upon QGraphicsView) and manages StelApp and StelGui as subobjects. After initialization, it manages user's input event propagation and event loop. the Graphical User Interface (StelGui). It is based on styled Qt widgets which are rendered directly in the OpenGL window. Windows can be created using StelDialog subclasses. Users actions can trigger signals which are connected to core and StelModules slots. Many UI controls can also be directly connected to StelAction and/or StelProperty instances to reduce the amount of boilerplate code required to link UI changes to the back-end modules and vice-versa.